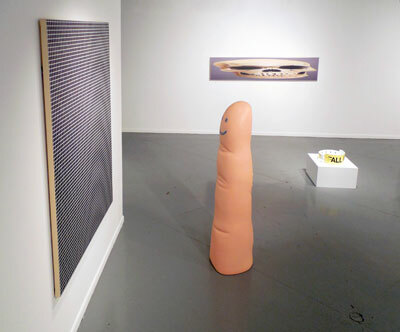 IMAGE: Installation view of Rachel Hecker: Group Show at Art League Houston. Photo: Jennie Ash. According to Rachel Hecker, her latest exhibition at the Art League Houston is a “show of anomalies.” The Art League selected Hecker as its 2013 Texas Artist of the Year, and is hosting Group Show in conjunction with the honor. Hecker finds the works shown here to be “persistent and pestering, but out of context,” and outliers from the overall trajectory of her practice. Still, perhaps defining the works as anomalies is Hecker’s acknowledgment that she is adopting painting styles, materials, and genres that have been all but banished from contemporary art. Take Winter Scene (2013) for example. At first glance, it is a rudimentary landscape painting if there ever was one. The ground gently slopes under snow-dusted fir trees, with a dense, misty white background obscuring trees in the distance. 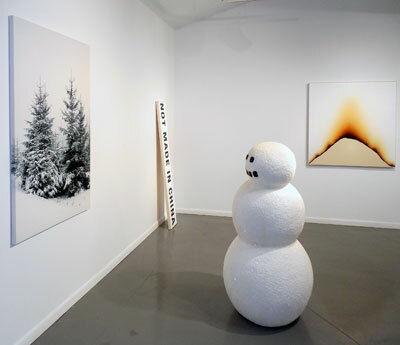 Installation view of Rachel Hecker: Group Show at Art League Houston. Photo: Jennie Ash. But this is not any ordinary landscape painting: rather, it is a landscape photograph, printed onto canvas. By swapping technology for the artist’s hand, Hecker precisely marks the point at which painting as a medium fails her, for to paint this work simply would not have been real enough. Despite being a skillful painter, this exhibition shows Hecker to be unafraid of the medium’s limitations. She embraces new technologies as a way to map painting’s prospects beyond two dimensions. In QR Code Painting (From paintings that do something) (2010), scanning the painting with a phone app downloads an image of a chimp looking at itself in a mirror. On one hand, the work is a painted matrix barcode, but with technology, it also tethers an altogether separate image to that painting. Other works from this series don’t function as seamlessly as QR Code does. In Pixel Skull (2010), the pixels never really coalesce into a clear image of a skull (even when re-taken with camera). Anamorphic Skull (2010) doesn’t successfully condense into a compacted memento mori, as it does with the predecessor it surely refers to, Hans Holbein the Younger’s The Ambassadors from 1533. It might not matter that they don’t work. Maybe it’s the point. 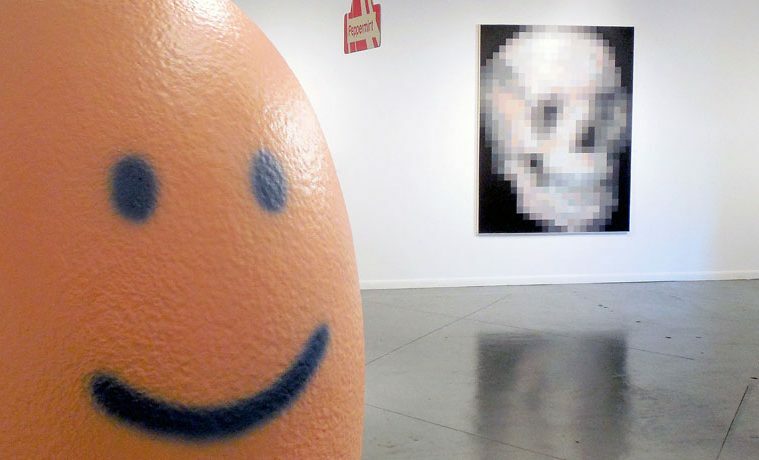 Utilizing optical illusions in an art show should be goofy to the point of gracelessness. This is especially so in works like Floating Xanax (2013), a pill bottle magnetized and mechanized to spin hovering above a pedestal. But in Hecker’s hands, even disco ball motors are capable of delivering a raw emotional impact. In this way, many of the pieces become downright mesmerizing. The peanuts in Peanuts (2013) dance around, sporadically standing on point, while others vulnerably huddle around each other at the edge of a plinth. Burn Painting #2 (Series #2) (2013) is painted to look as if Hecker has burned an arced line into the canvas. Few other artists could render a destructive gesture like the burn so delicately and painstakingly. She has then, of course, lined the burn mark with glitter. With Hecker, the best works are funny, until they become deeply, obstinately moving. Hecker often masks a work’s content with a sardonic wit, but selecting her “anomalies” as the constituents of her award exhibition may be Hecker’s wryest joke yet. In exhibiting pieces that presumably fall outside of the work she is being recognized for, the premise of the show questions the very premise of such an award. It’s especially potent commentary in light of current misgivings surrounding the art-world’s biennial culture. How long does an artist have to be working to be deemed suitably venerable for a best artist award? By what criteria and within which parameters must a body of work lie? Hecker responds with her fits and starts, and the works that continue to puzzle her. She demonstrates that an art practice is a process, not a series of finished products. Hecker may be the Texas Artist of the Year, but that doesn’t mean a thing to her.